Atlantic whitefish are found in Milipsigate, Minamkeak, and Hebb Lakes in the Petite Rivière watershed. Historically, the species was only found in the Tusket River Watershed in Yarmouth County, but is now considered extirpated from this system. ​Both natural and human-induced pressures and threats have contributed to the decline and continued low abundance of the species. These include: acidification of aquatic habitat as a result of acid rain, poor land use practices, barriers to fish passage, and the introduction of non-native species, smallmouth bass (Micropterus dolomieu) and chain pickerel (Esox niger), into the watershed. An Atlantic whitefish swims in the holding box of the rotary screw trap on December 7, 2018. This individual was the first live adult Atlantic whitefish observed in the wild since 2014. 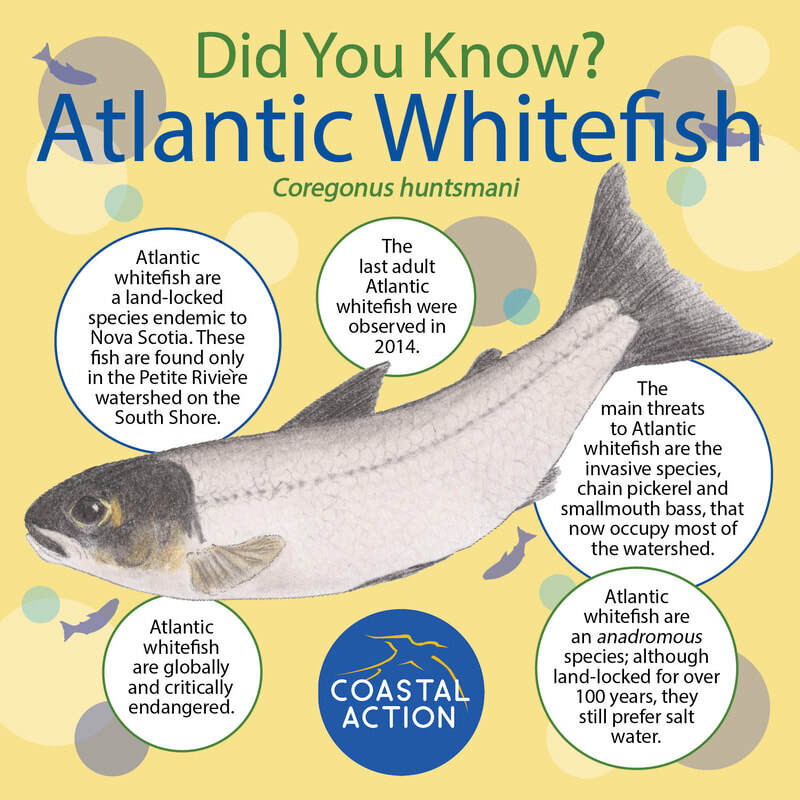 For more information please contact our Atlantic Whitefish Project Coordinator, Andrew Breen, at andrew@coastalaction.org. Click HERE to view our Atlantic Whitefish story map. Coastal Action initiated the Atlantic Whitefish Recovery Project (AWRP) in April 2004 in partnership with the Atlantic Whitefish Conservation and Recovery Team (AWC&RT). Our long-term goal is to stabilize the current population of the Atlantic whitefish and, if possible, to re-establish the anadromous nature of the fish, which will, in turn, expand their current range. The project began with a focus on raising public awareness of this globally endangered fish species, as well as attempting to build a strong stewardship foundation in Lunenburg County. Our long-term goal is to stabilize the current population of the Atlantic whitefish, and if possible, to reestablish the anadromous nature of the fish and expand their current range. The Atlantic whitefish was declared endangered by COSEWIC (Committee on the Status on Endangered Wildlife in Canada) in 1984 and is protected under the Maritime Fisheries Regulations, the Federal Species at Risk Act (SARA), and the Nova Scotia Endangered Species Act. Over-fishing, acidification, inadequate fish passage, and the introduction of non-native species are believed to have contributed to the loss of this species on the Tusket River in Yarmouth County. The Atlantic Whitefish Conservation and Recovery Team (AWC&RT), established in 1999, consisted of DFO, Nova Scotia’s Department of Fisheries and Aquaculture, and Department of Natural Resources. The AWC&RT invited Coastal Action to become an active member of the committee in 2003. Learn to distinguish Atlantic whitefish from lake whitefish (see publications below). Carefully release accidentally caught Atlantic whitefish immediately. (Removal of the Atlantic whitefish has been prohibited from all Nova Scotian waters since 1970 by the Nova Scotia Fishery Regulations under the federal Fisheries Act). Help stop the introduction of invasive species. It is illegal to move fish from one body of water to another. Ideally, never use live bait, and remember to clean, drain, and dry all boating equipment when travelling between lakes. Spread awareness about the Atlantic whitefish in your community.